Ever have that thing where you've been waiting for a certain type of nail polish for what seems like forever and then two come along at once? Well, let me introduce you to Loreal's Confetti Top Coat (on the right). I picked this up a couple of months ago from Boots for £3.99. 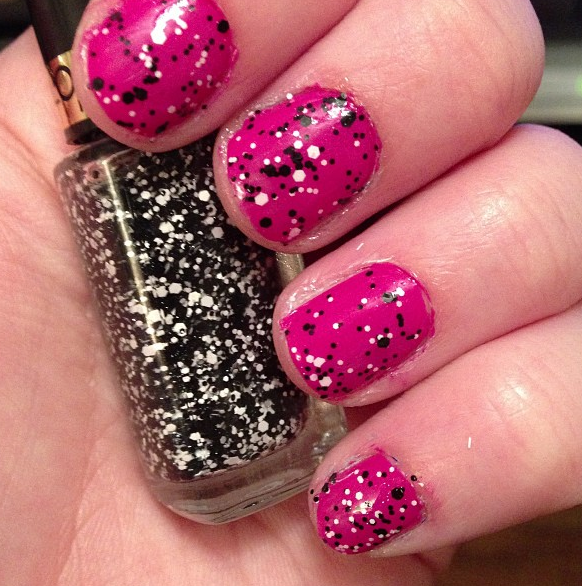 It's a clear polish with small and large specks of black and white. 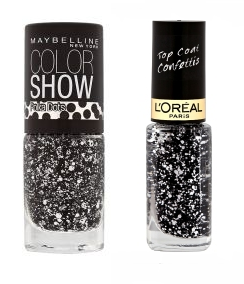 Then there comes Maybelline's Color Show Polka Dots in the shade Chalk Dust. It's also a clear polish with black and white pieces but was a pound cheaper at £2.99. But which one is best? Which should you pick up? Well, here's my review on the two of them. I believe that this is two coats. As you can see, it's quite sparse and a bit uneven in places. I found it quite difficult to spread the specks around and it sort of looked a little... unfinished. As you can see, this polish has a much denser distribution of the specks and also has a more varied selection of sizes which gives a better effect in my poinion. This is also only one coat, which is a plus. So, which would I pick? The Maybelline one hands down! It's much easier to distribute over the nail and I think it looks a lot better. It's also cheaper and you get more product! Hey Sarah! I haven't tried the confetti, but LOVE the Polka Dots!!! I bought the speckled pink and am really pleased with the finished result.